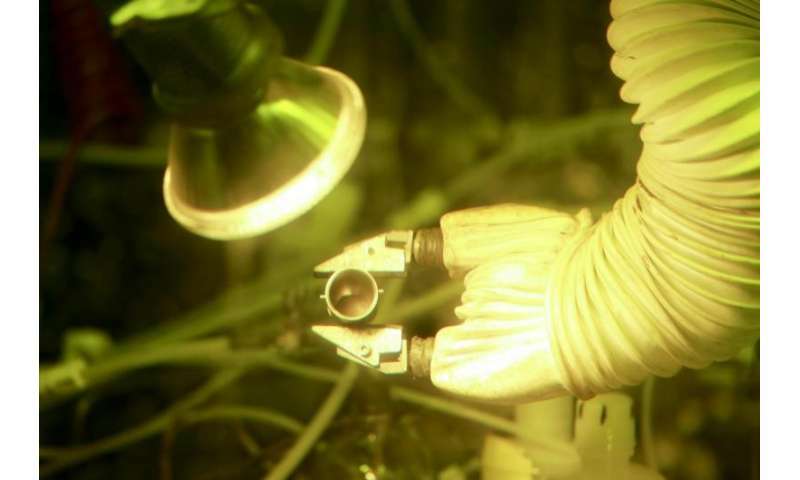 Plutonium-238 produces heat as it decays and can be used in systems that power spacecraft instruments. The new sample, which is in the same oxide powder form used to manufacture heat sources for power systems, represents the first end-to-end demonstration of a plutonium-238 production capability in the United States since the Savannah River Plant in South Carolina ceased production of the material in the late 1980s. Researchers will analyze the sample for chemical purity and plutonium-238 content, then verify production efficiency models and determine whether adjustments need to be made before scaling up the process. "Once we automate and scale up the process, the nation will have a long-range capability to produce radioisotope power systems such as those used by NASA for deep space exploration," said Bob Wham, who leads the project for the lab's Nuclear Security and Isotope Technology Division. The success of Wham and a team of engineers and technicians at ORNL comes two years after NASA began funding the DOE Office of Nuclear Energy through a roughly $15 million per year effort to revive the department's capability to make plutonium-238. Production begins at Idaho National Laboratory, which stores the existing inventory of neptunium-237 feedstock and ships it as needed to ORNL. Engineers mix the neptunium oxide with aluminum and press the mixture into high-density pellets. They use the High Flux Isotope Reactor, a DOE Office of Science User Facility at ORNL, to irradiate the pellets, creating neptunium-238, which quickly decays and becomes plutonium-238. The irradiated pellets are then dissolved and ORNL staff use a chemical process to separate the plutonium from remaining neptunium. The plutonium product is converted to an oxide and shipped to Los Alamos National Laboratory, where the material will be stored until needed for a mission. Remaining neptunium is recycled into new targets to produce more plutonium-238. There are currently only 35 kilograms, or about 77 pounds, of plutonium-238 set aside for NASA missions, and only about half of this supply meets power specifications. This is only sufficient to power two to three proposed NASA missions through the middle of the 2020s. Fortunately, the additional material that will be produced at ORNL can be blended with the existing portion that doesn't meet specifications to extend the usable inventory. With continued NASA funding, DOE's Oak Ridge and Idaho national laboratories can ensure that NASA's needs are met, initially by producing 300 to 400 grams of the material per year and then, through automation and scale-up processes, by producing an average of 1.5 kilograms per year. "With this initial production of plutonium-238 oxide, we have demonstrated that our process works and we are ready to move on to the next phase of the mission," Wham said. The next NASA mission planning to use a radioisotope thermoelectric generator is the Mars 2020 rover, due to be launched in July 2020. The mission seeks signs of life on Mars and will test technology for human exploration and gather samples of rocks and soil that could be returned to Earth.